1, the machine filling material viscosity up to 3000CP. 2, filling volume of 100 ~ 500ml to achieve stepless adjustment. 3, the quality of sealing is stable, the rate of broken bags is very low (less than two thousandths). 4, important components are used internationally renowned brands. 5, using optical tracking and dual control system. 7, automatically print the production date (double row, each row of 12 characters). 8, man-machine interface touch screen control work, cleaning, debugging and other functions. 9, the bag length can be stepless adjustment within the design range, in order to achieve the packaging capacity of different requirements. 10, the machine working with no bags film, the machine will be alarm. 11, the machine uses the side film, so that the bags flat, no wrinkles. 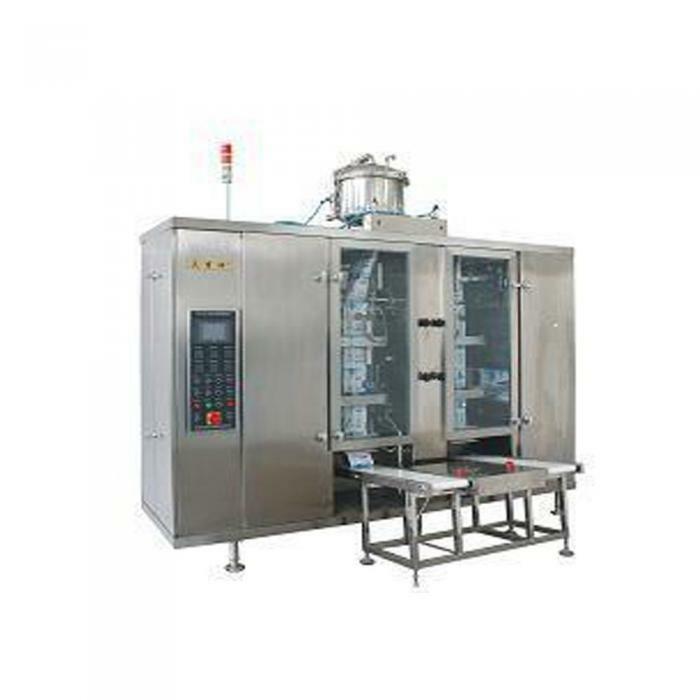 Double frame membrane shaft device and film device ，this machine can working without stop. 13, Equipped with a 100 grade purification device ,Clean equipment standard. 14,liquid level control:we use electrode-type liquid level controller, the level of smooth, to ensure filling accuracy.